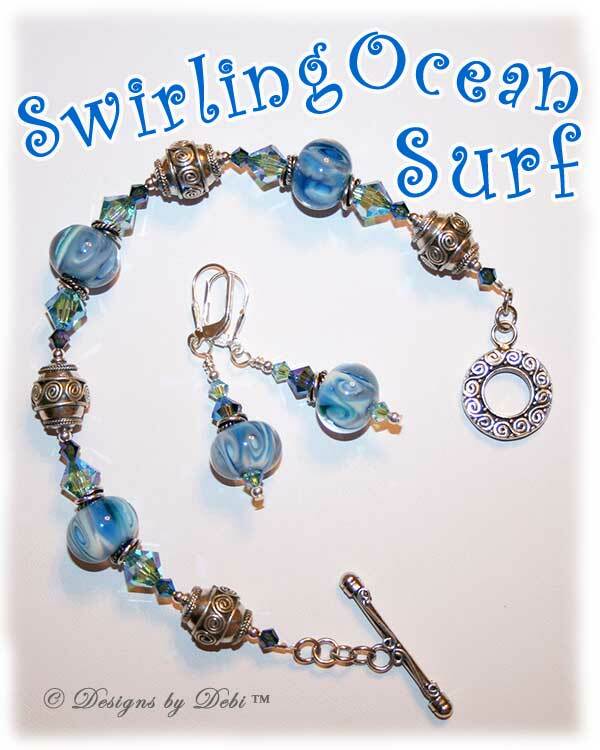 I named this set Swirling Ocean Surf because that's exactly what these beautiful lampwork glass beads remind me of. 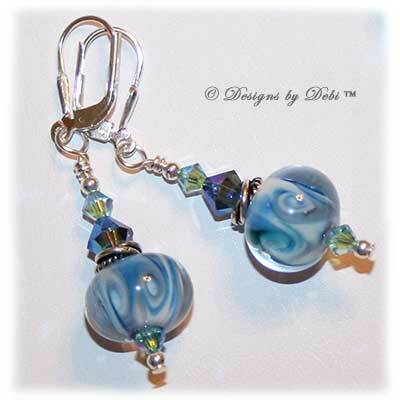 They were made by Tricia Hampo of Tricia's Lampwork Creations. To accent the beads and recreate the effect of ocean waves twinkling in brilliant sun, I used Swarovski Crystal bicone beads in Aquamarine AB2x and Montana AB2x and it worked beautifully. The photos don't begin to capture the effect. 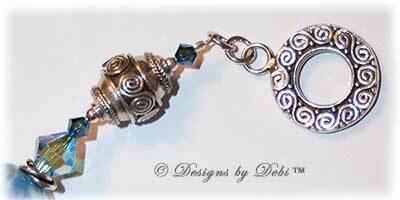 It will have you daydreaming of the ocean with every glance :) I continued the swirling theme with these gorgeous Bali silver beads, twisted rings and elegantly scrolled and detailed toggle clasp. The sterling and Bali silver leverback-style earrings match the bracelet perfectly. The donation from this month's piece is again going to the American Red Cross. As I told you in May and June, there are many people still suffering the effects of Hurricane Katrina and there has been a horrible outbreak of tornadoes and floods this year leaving thousands of families' lives destroyed. The Red Cross plays an enormous role in helping all of these people so I want to take this opportunity to help them so they can keep helping those who need it most. I've completely lost track of the incredible number of tornadoes we've had, the cities and towns affected by the floods and the billions of dollars in damages caused by them both. But we've all seen the horrible images and heard the heartbreaking stories on the news...entire neighborhoods destroyed, people watching as their homes disappeared under water, children ripped from their parents arms by the force of the winds, so many people thought they were going to die...and so many did. There are untold numbers of families who have literally lost everything. My heart goes out to every one of you and I will continue calling attention to the need and doing my best to help. To find out more about The American Red Cross and the work they're doing or to make a donation on your own, go to www.RedCross.org. The bracelet measures 9 1/4 inches from end to end. I left extra links on the toggle to fit a larger range of sizes and allow for adjustments. As is it will fit a 6 1/2 - 7 1/2 inch wrist. If you need the bracelet re-sized, please let me know at time of purchase and this can be done prior to shipment at no additional charge.